I love cheesecake, especially baked cheesecake. I also love Eton mess, so I made the brave decision to combine the two. Actually there’s nothing brave about it, these two classics were obviously going to work together and I’m not the first person to do it. 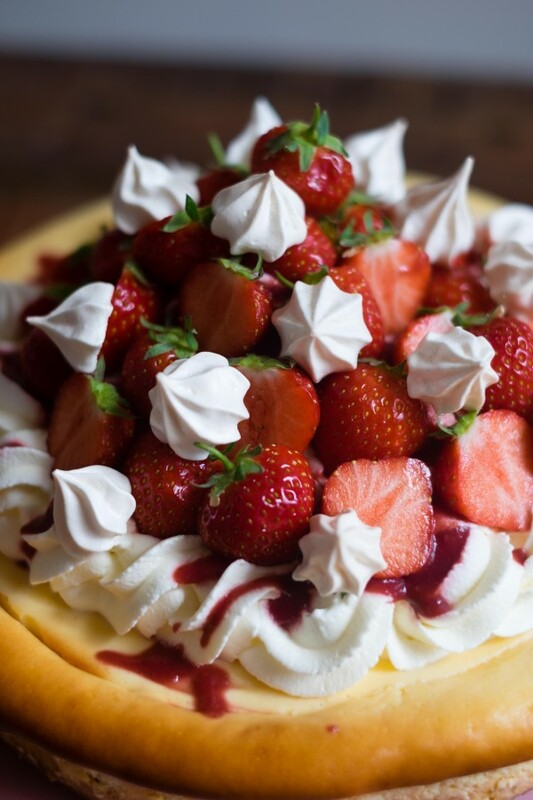 I have tried to make something pretty though and lurking beneath all that cream, strawberries and meringue is the hugest crack right in the middle of the cheesecake – so if your’s does the same, just cover it like I did! I never used to think of a baked cheesecake as ‘patisserie’, however when someone like Christophe Michalak makes cheesecake, I think I can make it on here. I didn’t have a plan to make this dessert, but when Thornback & Peel got in touch and asked if I would like to have one of their tote bags and some of their items for a giveaway (mentioned later), I knew I had to make something thoroughly British for this British company. What better fruit to use than strawberries, especially as they have a range celebrating this amazing berry. 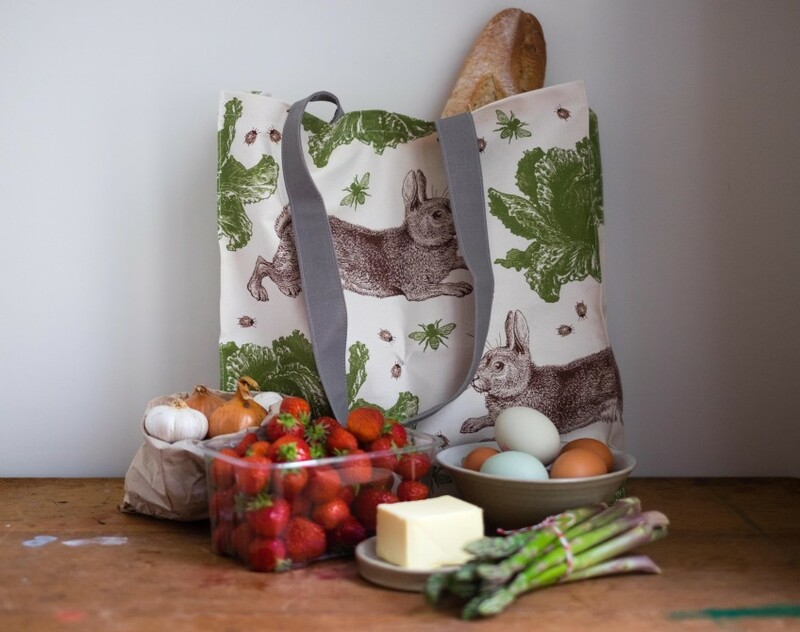 I’m a huge fan of Thornback & Peel, I own a lot of their products, from cushions to oven gloves and aprons, so I’m really pleased they asked me to share what I carry in my #TandPTote. Unsurprisingly, my tote generally contains food shopping, especially now there is a charge for plastic bags. I know that makes me sound very penny pinching, but instead of carrying a scrunched up ‘bag for life’ to the supermarket, I’d much rather have one of these totes stowed away in my handbag. 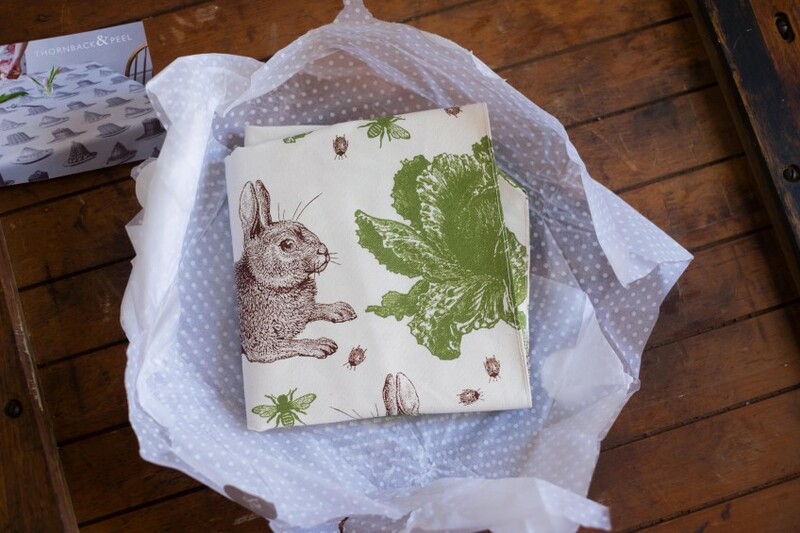 I opted for the rabbit and cabbage #TandPTote which is one of my favourites. I’m probably biased though as I had a house rabbit for 9 years! This bag is great, it’s the perfect size and you can fit a lot in it, it’s also very comfortable. If you feel like getting your own #TandPTote you can see them all here and if you use the code: PATISSERIE you can get a further 15% off a tote bag, or anything else from their range, the code is valid until midnight on 08/07/2016 and it cannot be used in conjunction with any other discounts. 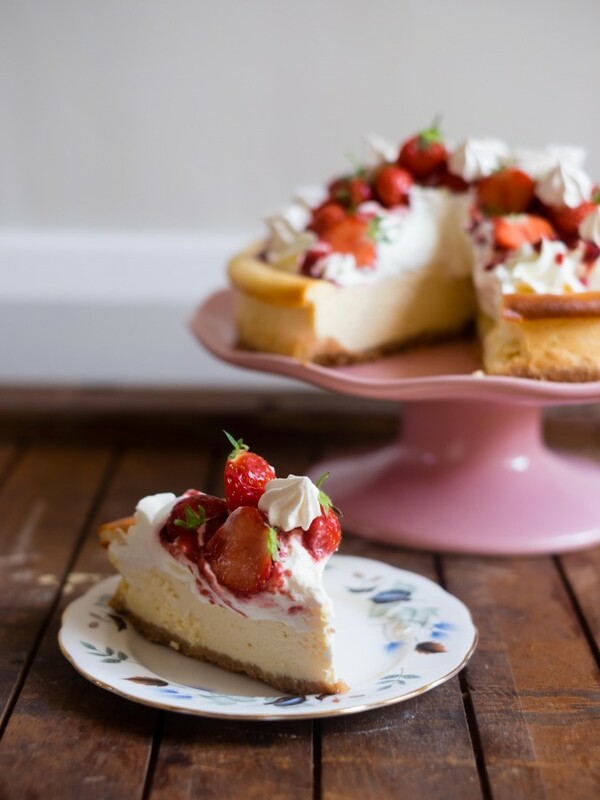 This cheesecake is really simple to make and it can be made in advance and then decorated just before serving. Also if you want to change things by using other berries, I wont mind, although I think it works best with strawberries. Preheat the oven to 180C Fan/350F/Gas 4 and grease and line the base of a 23cm cake tin that is at least 5cm deep. Place the biscuits in a food processor or mini chopper and blitz them until they are like breadcrumbs. Melt the butter and then pour in the biscuits and mix to coat evenly. Press the biscuits into the base of the prepared pan, use your hand to make sure they are pressed down evenly. Bake in the oven for 10 minutes, then remove from the oven and put to one side to cool, reduce the oven temperature to 160C. In the bowl of a stand mixer fitted with the paddle attachment, mix together the cream cheese and sugar until smooth. Add the flour and soured cream and beat again. Slowly add the eggs and vanilla extract, beat the mixture so that it is fully combined. Pour the mixture onto the biscuit base and level with a spatula. Bake in the oven for 45 minutes, the cheesecake will be just set with a slight wiggle and a golden edge. Leave the cheesecake in the oven, with the door ajar and the oven off, this will help stop the cheesecake from cracking on top. While the cheesecake is cooling make the meringues, whisk the egg whites in a clean bowl and when they are white and frothy slowly add the sugar a spoonful at a time. Keep whipping the egg whites until they are thick and glossy and form a stiff peak. Using a French piping tip, pipe small meringue blobs onto a baking sheet lined with baking parchment. Bake the mini meringues preheat the oven to 120C/100C Fan, when up to temperature bake for 2 hours and leave in the oven to cool. To decorate the cooled cheesecake, whip the cream until it holds stiff peaks. Using a star piping nozzle pipe swirls of cream onto the cheesecake, so that all of the cream is used up and work upwards so the cream is higher in the middle. Drizzle the strawberry puree over the cream, you may not need all of it, but use as much as you like. 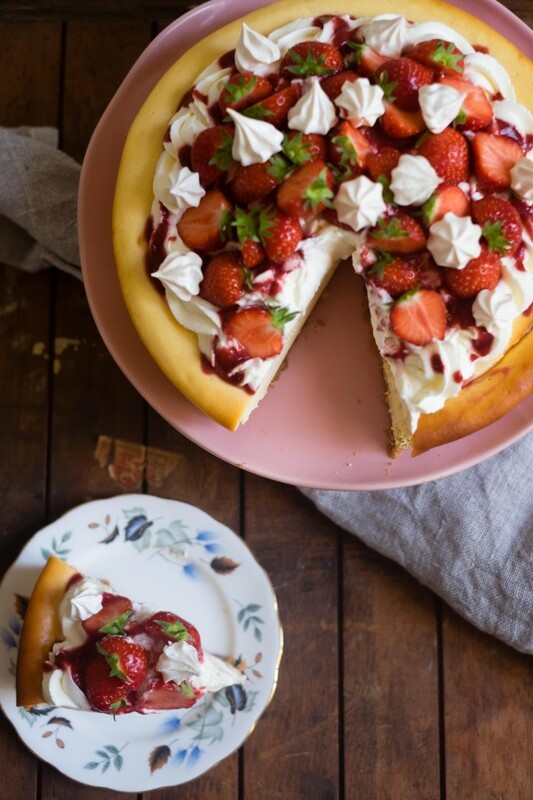 Slice the strawberries and arrange them on top of the cream in a circular pattern and dot the top of the cheesecake with the cooked meringues. You will need a 23cm cake tin that it as least 5cm deep and a French piping tip and a star shaped piping tip. 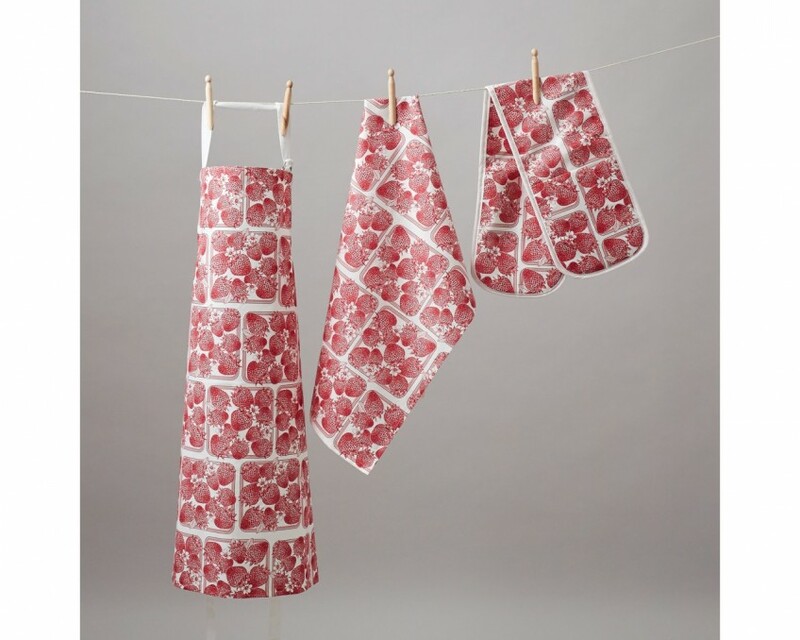 Thornback & Peel have very kindly donated a strawberry gift set to giveaway to one of my readers. This has an RRP of £51 and I’m sure you’ll agree, it’s gorgeous. Also if you want to buy one of their lovely tote bags, or anything else from their range, they have an exclusive 15% off code for my readers to use. Visit their site and use the code: PATISSERIE, the code is valid until midnight on 08/07/2016 and it cannot be used in conjunction with any other discounts. Remember to share what you carry in your #TandPTote on social media too. Thank you Margot, it’s amazing- you’ll love it! Aww Jodie you are so sweet for remembering Stanley! Bless him. Yes I love the rabbit stuff I can’t help myself. What a gorgeous recipe!! So glad I’ve found this site. My packed lunch for work! I really love the design on this tote. I would definitely use it for carrying groceries and it would also be a good bag for carrying my Reiki Drum in. I would carry treats for my grandson when I collect him from school! My book and a drink. some tshirts when i go tshirt shopping. my lovely ingredients to make some of these lovely recipes on this blog!! Umbrella and sunglasses – both essential daily items for any season in the UK. Cat food and milk as that’s all I seem to carry these days. all my random shopping, those 5ps add up! Always a book and reading glasses- essential wherever I go. Everything – it would probably become my new handbag! I would use it to carry my bits and bobs that I take with me for my children. Fresh fruit and veg from the farm shop. We have a market twice a week with lots of fresh fruit and veg. I think this would be perfect for my market bag! My current one is looking a bit sorry for itself! goodies for going on a day out, tissues, wipes, a comb for going shopping. Fruit and vegetables; the softness of tote bags makes them ideal for that. Notebook and pen for when inspiration strikes! I’d carry my ukulele music! 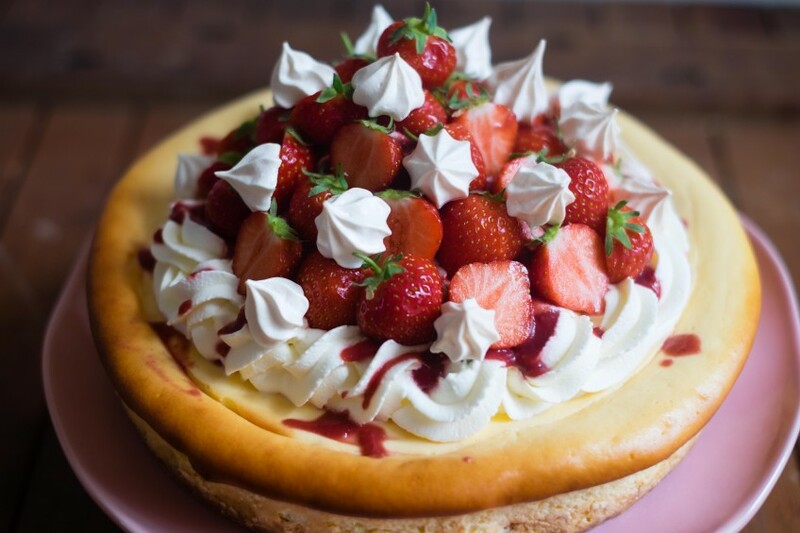 A Beautiful cheesecake. I would carry my shopping bits. My freshly baked goodies ! I would carry my shopping in it if I won a Thornback & Peel tote. 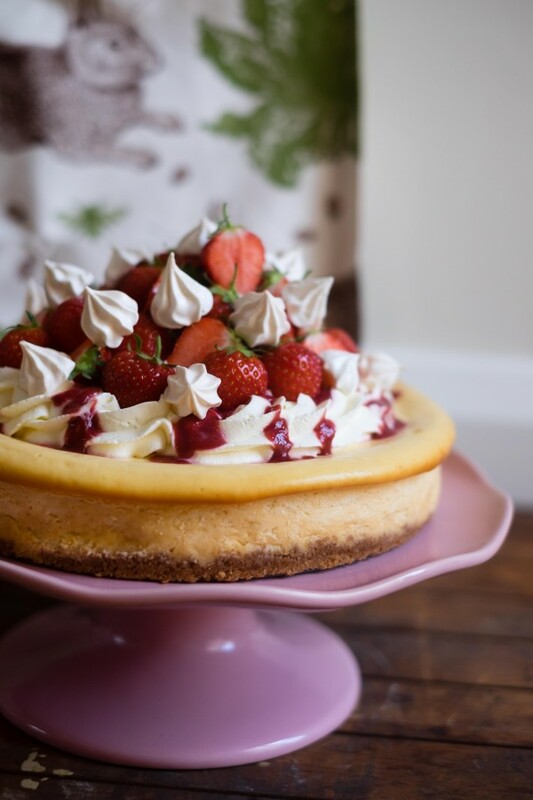 What an absolutely gorgeous cheesecake! I love Eton mess not sure why I never thought to combine the two. Looks amazing. Wet wipes, sun cream, water and poo bags when I take my dog for a walk. My much too large food shop! It would be ideal for carrying shopping. I would carry some shopping in it! I’d use the bag as an organiser for my important paperwork. It would be great to carry my fresh fruit and veggies from the greengrocer! 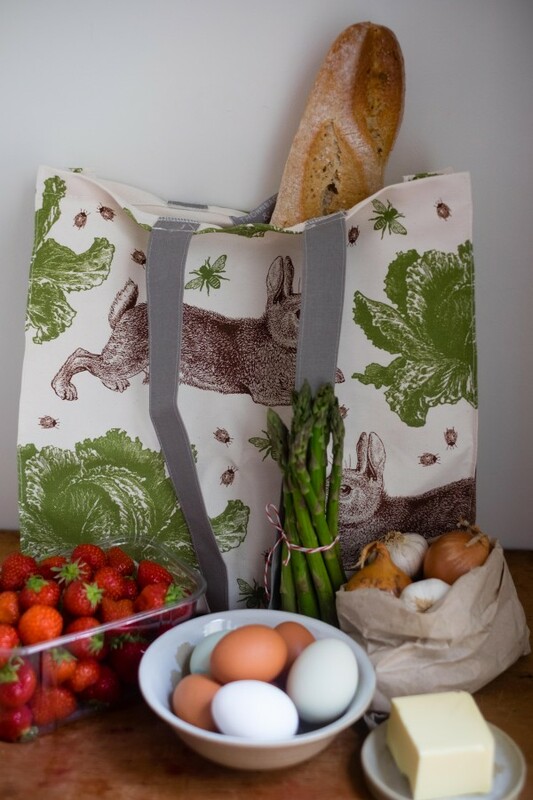 I’d carry my daily shop items…love totes – million times better than plastic carriers and they save you money. I’d use it for quick trips to my local shop. i would fill it with my ingredients for that days baking session! I’d tuck it into my pocket for the next Farmer’s Market. I always come home with more than I intend to! I’d take it to the shops to buy fruit and veg, and come home with it full of cake! I’d carry my shopping in it. Probably shopping, I like to keep little bags with me all the time now the plastic bag charge is in effect. I would use it to carry a picnic in. My shopping, perhapa for Eton Mess Cheesecake! I think i would use this tote bag on weekends away at the Lakes and that sort of thing .. when you want to buy souvenirs and the odd cake but don’t want everybody to know just how many cakes you bought! I’d use it for shopping trips to our local greengrocer! To carry clothes and accessories shopping. Perfect Tracy – it’d look great too. I would probably use it for popping into town to carry light items. To be honest I’d probably carry books in it to and from the library. I adore having a special book bag and the rabbits on it are just adorable! Borrowing cook books is such a fantastic idea! I’ve never actually done that but I think, now you’ve mentioned it, I might have to venture from the romance section to the cookery one! A woman after my own heart Julie! It would be a hard decision whether or not to use the bag for food shopping like you, or to make it a project bag for my knitting. Tough call. Thank you Kate! It tasted amazing.